For vacationers to Aspen, the Aspen Nordic center provides probably the ultimate cross country ski and snowshoe experience in Colorado, and it is entirely free! If you are traveling to the Aspen / Snowmass area during the winter, be sure to check out the free Aspen and Snowmass nordic trail systems, with over 37 miles of groomed classic and skate trails as well as snowshoe trails for hikers and their dogs. You can even link up trails to Basalt creating a system over 60 miles long! 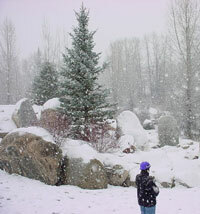 This is a popular Aspen attraction for outdoor lovers in the winter. The winter scenery is absolutely amazing, particularly on bluebird days or during heavy snowfalls. This is a free Colorado attraction that I highly recommend.